Sometimes, instead of asking why, you have to ask, why not? Such is the case with these taco cones. Of course there’s nothing *technically* wrong with tacos as they are, but sometimes we like to mix it up. 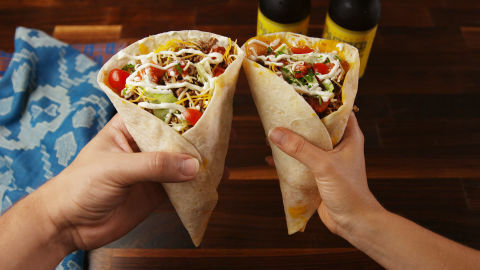 In a way, these are sort of a hybrid between tacos, burritos, and ice cream cones. They’ve got all the fillings you want in a taco: ground beef, Mexican cheese, lettuce, tomato, and sour cream. Instead of corn tortillas, we took a page out of burrito’sbook and utilized their tasty flour tortillas. And for the shape? That’s all ice cream cone. I know it sounds weird but it’s actually very convenient! So how do we get these magically conical tortilla cones? It’s a lot easier than you might think. Lay your tortilla flat on a microwave safe plate and sprinkle on side generously with cheese. Microwave for 30 seconds or until the cheese is melted, then roll it up cone-style! In order to keep it’s shape, you’ll need to put something inside the tortilla so that it dries correctly. We found a rolled up square of parchment paper does the trick. When your cone is cool and holding it’s shape, fill ‘er up! Any of your favorite taco fixings will do, and it’s the perfect vessel for a customizable taco bar. You cone do it! Sprinkle each tortilla all over with with 1 cup cheese each, making sure to cover the edges. Place in the microwave to melt the cheese, 30 seconds on high or until fully melted. When cheese is melted, roll into cone shape. 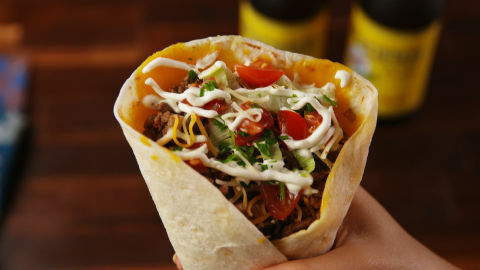 Place a rolled up piece of parchment paper in tortilla and allow to cool, 10-15 minutes. Meanwhile, make taco meat: In a medium skillet over medium heat, heat oil. Add onion and cook until tender, about 5 minutes. Add ground beef and taco seasoning, breaking up the meat with a wooden spoon. Season with salt and pepper, and cook until the beef is no longer pink, about 6 minutes. Drain fat and set aside. 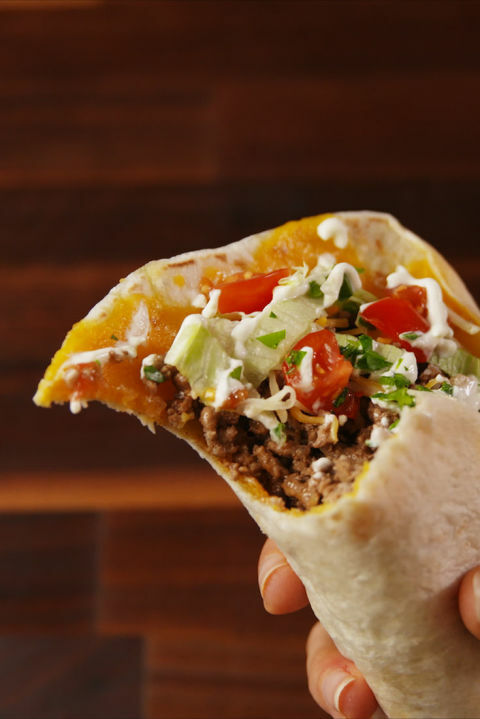 Fill cones with taco meat, tomatoes, lettuce, and more cheese if desired. Drizzle with sour cream, garnish with cilantro, and serve.